Go beyond the shopping malls and tall buildings during your Dubai holidays. While on a holiday in Dubai, indulge in adventure activities like fishing, kayaking, hiking, rock climbing and stand-up paddling. There are an array of activities to indulge in Dubai with family and friends of all age group. Read the list to experience the city of Dubai in its true sense. To experience all this, you just need a flight ticket and a Dubai visa. Here are 25 things to do in Dubai. 1. Fly like Aladdin on the magic carpet as you relive the Arabian Night folklore through quaint by-lanes of Bur Dubai. Key monuments like Al Shindagha Museum, Sheikh Saeed Al Maktoum’s House, Al Fahidi Fort offer you an insight in to the history of the Arabs. 2. Visit the only Hindu Temple in Al Bastakiya, Old Dubai. 3. Shop for shawls and sheeshas from the traditional streets of Al Karama. 4. Hop in to a hot water balloon and splurge in the Arabian Skies. 5. Try the local favourites - Lebanese Manousheh, Chelo Kabab and the charcoal fired fish, Iraqi Maskouf . 6. Ride the Abra (a traditional boat made of wood) at Al Sabkha. 7. Cruise a Dhow in the Dubai Creek. 8. Sip the traditional Arabian tea. 9. Go on a Desert Safari and experience camel riding, sand boarding, sand dune bashing and quad biking on the hot sands of Sahara. 10. Eat barbeque in the sands as you watch the exquisite belly dancers perform. 11. Go on a deep sea fishing trip. You might just catch a crab or two. 12. Visit Dubai Dolphinarium and watch bottlenose dolphins perform aerobics. 13. Visit Jumeirah Mosque and experience divinity. 14. Shop at one of the the world’s largest shopping mall, the Dubai Mall. 15. Stay at Atlantis, The Palm on Palm Jumeirah, resorts build on the artificial island and experience ultimate luxury. Here you can also indulge in a day full of fun at Aquaventure Waterpark and The Lost Chambers. 16. 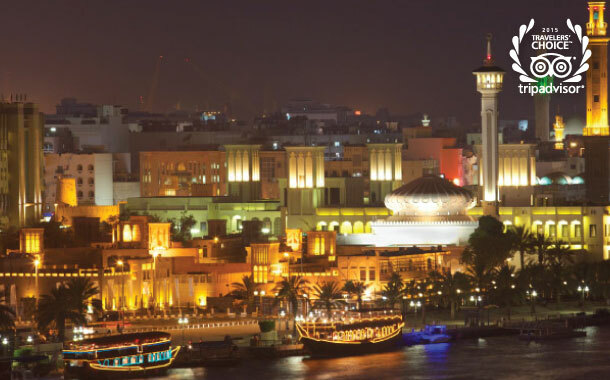 The ancient byways of Bur Dubai are home to one of the world’s best souks. Shop at their charming local textile, gold, fish and spices souks. 17. Get a ticket for a Ski Dubai in Mall of the Emirates and enjoy the experience of snow in the deserted region. 18. Soak up some sun at Beach Jumeirah. 19. Rise in the clouds of Dubai in a private helicopter ride. 20. Go for the Creek Park Bird Show and be amazed as the birds talk, dance, paint and marvel you with more such amazing stunts. 21. Take a selfie with the very curvy Burj Al Arab. 22. Feast on a local shawrma like the Sheikh. 23. Try your hand at stand up paddle surfing. 24. Attend the The Dubai International Jazz Festival that is a melodious confluence of the best of two worlds. 25. Lastly, experience a birds’s eye view of Dubai from the world’s tallest building, the Burj Khalifa. Visit the observation dock at Burj Khalifa and enjoy a breathtaking view of the city.